November is a special month to give thanks for all that we have. With Thanksgiving and families gathering, it’s the perfect time to reflect on the bounty that’s available to us both physically and mentally. Good food and comforts of family are some of the joys that surround us. Thanksgiving is also a time of great ritual, which in itself is comforting. I also like to add a few herbs and spices to my cooking that represent this time of year and reminds me of the flavors of fall. Like I mentioned in my post, Melissa’s Unique Herbs for Special Times in Life, I always have a herbs and spices on hand to support mental and physical health. I find that natural remedies soothe what ails me and makes me feel better than a medication that only masks a symptom. Add comfort to your days with a few special dishes prepared with some fall herbs and spices. Rituals also allow you to savor the season and drop into it with even more joy and abundance. Cooking at home is one of my favorite rituals. It allows me to infuse whatever I’m cooking with healing energy. I also know exactly what goes into the dishes I prepare, so I know exactly what I’m feeding my family. During the fall and Thanksgiving season, cooking with sage, cinnamon, and nutmeg envelops the house with a spicy warmth and reminds myself and James of the feeling of abundance every time we smell those scents. Sage is an herb that is used to add an earthy flavor to whatever it’s seasoning. As a member of the mint family, it is wonderful to help with digestive problems. Thanksgiving is an abundant season and sometimes that means having a bit too much to eat. If you’re feeling digestive discomfort like gas, stomach pains, or heartburn, relieve it with some sage. Sage also may help with memory loss and improves alertness and attention. The fragrance of sage in the air makes you feel alert. Add safe oil to a diffuser to use as aromatherapy to stay present and tuned into your surroundings, especially if you’re feeling tired from turkey. For all the good qualities that sage has, avoid this if: you’re pregnant or breastfeeding; have diabetes, cancer or issues with blood pressure (either too high or too low); and are prone to seizure disorders. Cinnamon comes in two popular forms: Ceylon (or “true”) cinnamon and Cassia cinnamon. Generally, the ground spice found at the grocery store is a combination of the two. 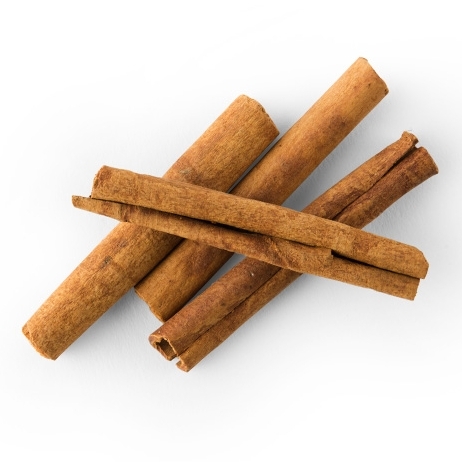 Whichever form, cinnamon is the bark of the cinnamon tree and you can find it dried in stick form or powdered. Cinnamon has a host of wonderful qualities, though it’s most known to add spice, warmth, and a bit of sweetness to your dishes. I have a hard time thinking of cinnamon without also thinking of apples! Along with being a popular spice, it’s also a natural stimulant. It may help to increase attention and brain function, stimulate insulin receptors, and reduce blood sugar spices by slowing down how fast your stomach empties after eating. It’s also an anti-inflammatory and anti-microbial. Nutmeg is one of the highly-prized, ancient spices known for its aromatic, aphrodisiac, and curative properties. As with the other herbs and spices mentioned, it’s great for digestion and pain relief thanks to its anti-inflammatory effects. It also helps to increase digestion and circulation. Nutmeg is an adaptogen, meaning it can be both a stimulant and sedative, depending on what your body needs. The oils in nutmeg are known to help with depression and anxiety as well as easing fatigue and stress. As I mentioned, I find rituals to be highly stress relieving. There’s so much comfort is repeating a routine. It triggers an automatic response that floods your body with calming hormones. Not to mention, you know the steps without thinking, easing yourself into a soothing rhythm without having to think about it. Making the same dishes each year is so grounding and comforting. I especially love using recipes that have been in my family for generations. It connects everyone at the table back to our roots and we can feel the spirit in the room. The traditions we carry with us are powerful and act like a ritual we perform every year. Reflecting on the Winter Solstice. I find myself drawn to this time of the year. There is a quiet inwardness for me on this side of the Celtic Medicine Wheel that allows me to dream, question who I am, and germinate. There’s so much potential in this time of year and it allows me to be still and find what I want to plant in the coming year. Coming back to the same flavors and routines help to anchor this time of year. They give you a touchpoint amongst the hustle and bustle of the holiday season. Thanksgiving is a time of reflection, and these herbs and rituals allow for ease and joy for moments of great gratitude.